The National September 11 Memorial Museum serves as the USA’s principal institution for examining the implications of the events of 9/11, documenting the impact of those events and exploring the continuing significance of September 11, 2001. Shocked by the events of that day, artists – like everyone – struggled to make sense of the unfathomable destruction and loss of innocent life witnessed that day. Fifteen years after the terrorist attacks, we return to that moment when the unimaginable became real through works by 13 New York City artists in the exhibition Rendering the Unthinkable: Artists Respond to 9/11. 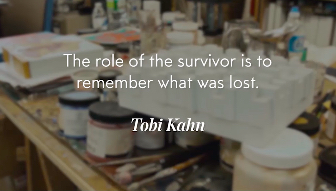 Tobi Kahn, Jewish Art Salon artist and advisor, is one of the 13. 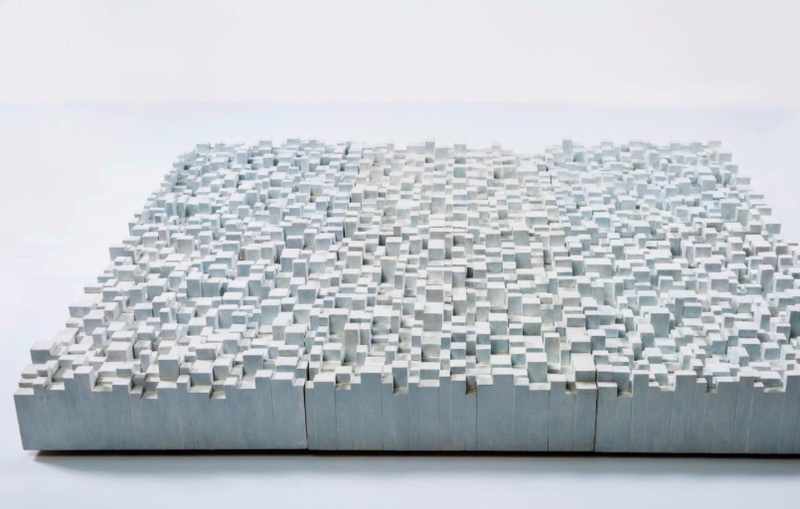 In conjunction with the 10th anniversary of 9/11, Kahn created M’AHL, a sculpture comprised of 12 independent segments for an installation titled Embodied Light: 9/11 in 2011. Constructed of wood pieces leftover from sculptures Kahn had made during the intervening decade, M’AHL embodies the artist’s memories of time spent with his parents and grandparents at Windows on the World, the restaurant high atop the North Tower. M’AHL is an abstraction of the view from that once-storied place, reimagined after the collapse of the Twin Towers. Kahn last visited the World Trade Center with his son just weeks before 9/11. On the day of the attacks, he witnessed the destruction from the rooftop of his studio in Long Island City. M’AHL is a 12-part floor sculpture comprised of thousands of wood remnants from works the artist had executed in his studio since September 11, 2001. The piece is meant to be viewed from an elevated perspective, suggesting the view from the North Tower’s Windows on the World restaurant. A native New Yorker, Kahn grew up in a community of Jewish immigrants who, like his parents, had fled Europe during the Holocaust. Tobi Kahn’s artwork is both spiritual and secular. His work explores themes of mortality, memory, and healing. In paintings and in sculptures of wood, stone, and bronze, Kahn creates memorials and other meditative spaces for public and private settings, including hospitals, hospices, galleries, and museums. The Museum’s 110,000 square feet of exhibition space is located within the archaeological heart of the World Trade Center site – telling the story of 9/11 through multimedia displays, archives, narratives and a collection of monumental and authentic artifacts. Visitors can currently access the Memorial at the intersection of Liberty Street and 180 Greenwich Street, at the intersection of Liberty Street and West Street and at the intersection of West Street and Fulton Street. Visitors can also use the entrance at Fulton Street and Greenwich Street daily between 6 a.m. and 8 p.m.